I on the other hand, found myself in the Manila Airport stuck, hungry, and bored, waiting for my six-hour delayed flight. Nope, no visions of loving people waiting for their family member’s arrival to warm my heart. Just a couple of bored, complaining and hungry passengers who suffered the same fate as I did. For some reason, my latest trip to Manila had caused me more money, time, hassle, and temper than all the other past trips I had combined. I have always been saying about how much I wanted to be a traveler. I want to be a backpacker, and just be able to get anywhere, anytime. I want to reach undiscovered places, and do things other cultures do, that’s why I was so excited about this one, because I get to fly home on my own. I wanted to see how it was to actually do it, all alone. But three hours turned to four and I already finished reading my book long before that. I found myself with absolutely nothing to do, and no one to talk to. They kept announcing boardings and arrivals, four hours turned to five, to six, but still our flight was never mentioned. The thing with first times is, you never really know what to do. So I sat there, listening to my music, never standing up to pee or bothering to grab the free food they were giving for the delayed-flight passengers. A lot of thoughts were running through my head. I familiarized myself with the feeling I get whenever I hear the bell for announcements, I was Hopeful. I wanted them so bad to announce MY flight, and every single time, I get disappointed because it would be something else entirely. So I did what I do best in situations where I’m feeling alone – I made up stories. Everyone who sat around me were either soul mates waiting to meet each other, a couple traveling for the first time, two people switching similar bags which will lead to a series of ironic and hilarious events or probably old men waiting for their flight to come home to their granddaughter’s wedding. I’m a closet-romantic rooting for everyone else’s happy ending, as you can probably tell by the stories I come up with. The hours passed and the characters of my story (the random passengers around me) came and went. I occupied myself with imagining their back stories, making up their names, thinking of how their conversations would go, and hoping that they would at least glance at each other, but they never did. And it was okay. In the back of my mind, they were going to meet again. I probably looked weird, laughing in my mind as to how the two strangers who sat on either side of me were going to see each other again, because in my mind it involved a lot of mud, and crazy yelling. But it was fun, I was not as bored as I was when I started. The thing is, I didn’t see the “love” that was being talked about in the “Love Actually” monologue. There was no hugging and kissing, no romantic hellos and goodbyes. But I did see it – in my imagination. 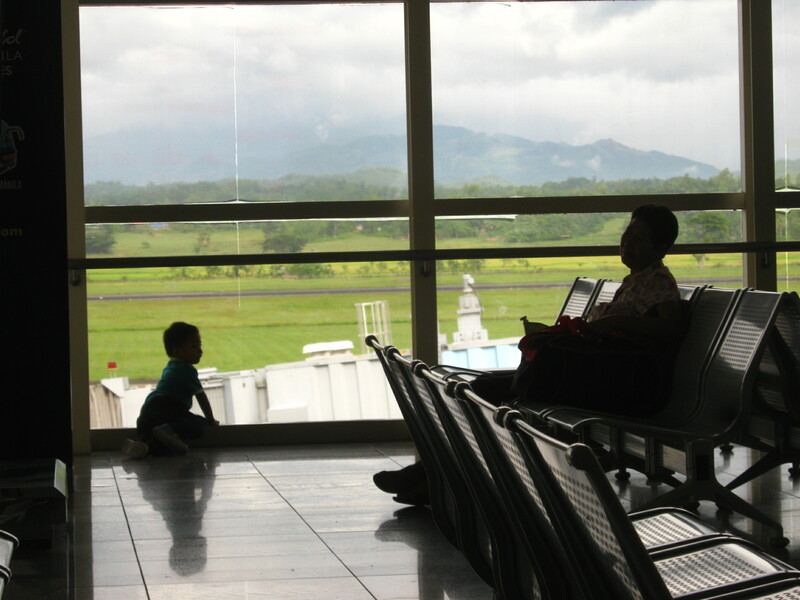 I took this photo in the Ilo-ilo International Airport. Finally they announced for our boarding, and a lot of people around me started cheering and clapping. I checked my watch and saw that I have been sitting there in my spot for eight hours and a half. That was probably one of the worst flight-experiences I’ve ever had, but, it might also be one of the best.